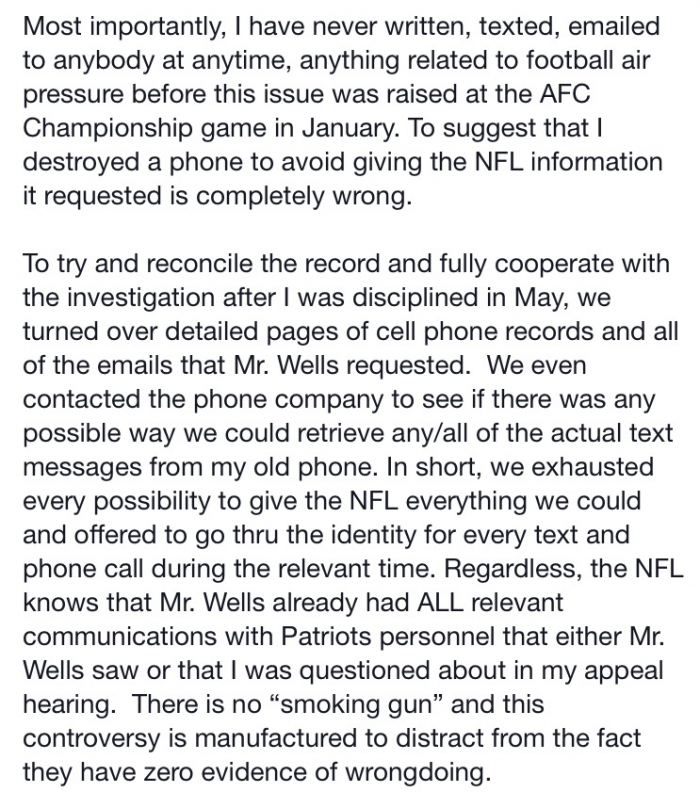 We have been waiting to hear from Tom Brady since news broke that Roger Goodell and the NFL upheld his 4-game suspension into Deflategate. While many of us who are supporters have our opinions. Many others around the country, whether it be professional athletes and/or fans have also voiced their opinions. 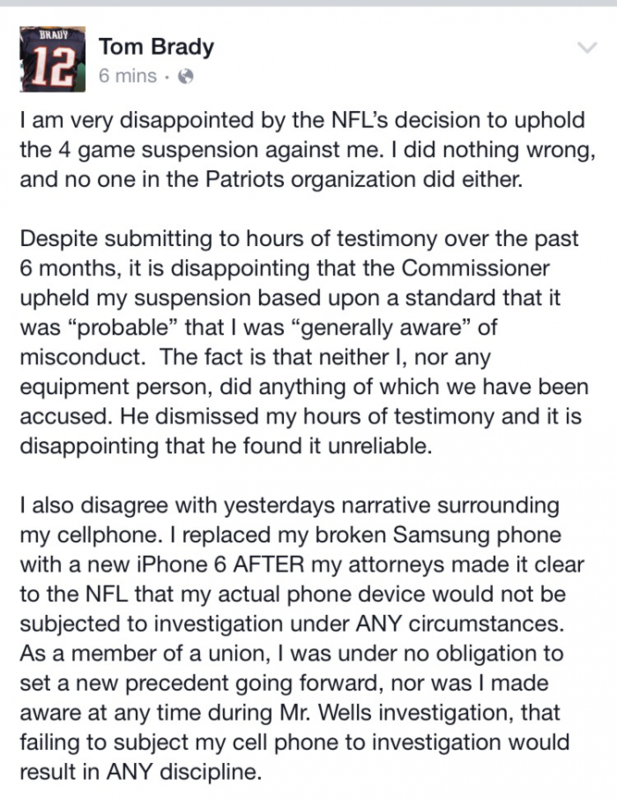 Tom Brady released a statement on his Facebook page to explain his disappointment. While the NFL has portrayed it a certain way, it is clear that certain information is being released by them to sway this in their favor. What should be taken into consideration is does the penalty fit the crime? Not only that, does the evidence support the penalty. It is rather unprecedented to have a suspension of this length associated with this incident. All you San Diego Charger fans know what I'm talking about and your team actually got caught! Final thought is, for all you people especially the analysts at sports networks such as ESPN and NFL network, you have your opinion and I get that. As employees and citizens, we have a right to our private information. You have an obligation to not only yourself but to many other colleagues to protect it, otherwise you set a bad precedent. As far as my opinion goes, I fully support Tom Brady. He's my quarterback (in my Terrell Owens voice)! For all you Patriots fans, if you really want to make a statement, I suggest you don't go to any games Brady is suspended for. I know the only way to hurt the NFL is to not give them any of your hard earned money. Let's see if you are actually willing to do so. 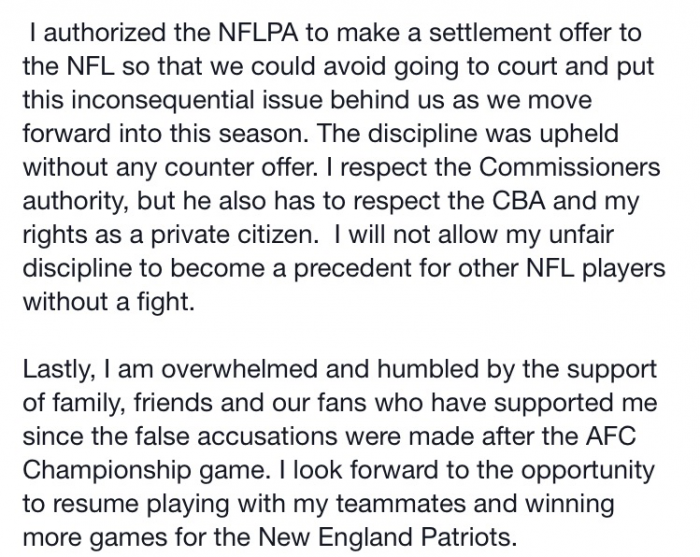 You can read Brady's full statement below.